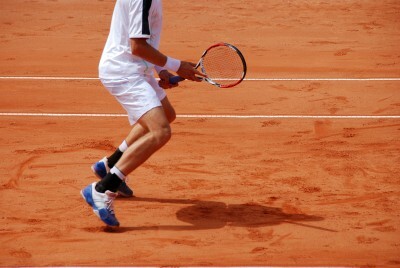 The split step is one of the "must have" footwork in tennis and should be a key move in everyone’s strategy box. It is very similar to the ready position. An easy description of this footwork is when you jump or hop up a little off your feet into the air, then land on your feet and feel the weight coming down. Then you shift your weight from foot to foot and can take off in the direction of the ball with a lot more power than if you didn’t do the split step. Due to the sheer power of your body that coils down into the landing, this step acts as a spring that can catapult you into action. This is like a super ready position on steroids, whereby you are ready to move in any direction the ball is traveling in once your feet land back on the ground. My tennis players learn that you should perform this step every time your opponent hits the ball. Once the ball leaves his strings you can see if you will need to move into position to make a forehand or backhand shot, so your coiled power that is dwelling in this simple footwork is ready to spring into the necessary direction for you to make your shot. When your opponent serves, you should be doing the split step, vaulting an inch or two off the ground. If it is a high velocity serve you may not know where it is going until it travels across the net, leaving you very little time to react. This step will afford you maximum flexibility in minimum time. When you see some of the tennis greats performing a split step, it looks like a hovering ready position, racket out front in both hands, knees bent, body angled slightly forward, eyes on the ball. Everything says “ready position” except for the anomaly that their feet are not on the ground. In the same way it provides speed when you need it, this footwork can also slow you down when you need to get to the net for a volley and are moving too fast. As you approach from the baseline, a few staggered splits where you land on the balls of your feet instead of on your toes on your way to the net will slow you enough that you won’t lose control of your movements or swings along the way. This move is all about maintaining balance in your body positions and the ability to perform excellent follow through. Don’t let the ease with which you can step into the split step deceive you into thinking it’s a piece of cake. Yes, the step itself is relatively easy and you don’t need to focus a lot of attention on the “how” of it. The part that can be tricky is the timing. When should you launch up into the air? When should you be coming down to make contact again with the court? Ideally, you launch yourself off when your opponent starts making contact between racket and ball, and you land on terra firma as you get a visual on where the ball is going, so you can spring right into action. From "Split Step: The Key To Reacting Correctly" To "How To Play Tennis Efficiently And Become A Better Player"
Learn more about techniques used in playing tennis. What are you waiting for? Join my over 2000 subscribers and grab your FREE Gifts now!. I promise to use it only to send you my Improve Your Tennis.com newsletter. Do you want to get the exact step-by-step blueprint to look, feel, and perform better on the tennis court in only a few short weeks? Pick up your copy of Show and Go today! OncourtOffcourt.com for Tennis and Fitness Training Aids! Click here!